Can You Clicker Train A Deaf Dog? I've been receiving wonderful emails from folks reading my blogs with questions so I want to share some since if one person has the question there maybe others curious as well. I was asked if it was possible to clicker train a deaf dog. The answer is yes! Clicker training is really positive reinforcement training. The clicker is used to "mark" the desired behavior you are wanting. If I want my dog to sit, I click as he sits and then reward with a treat or play of a toy. At the sea parks, they use a whistle to mark the behavior. But if the animal can't hear, what can be used? How about a pen flashlight. That can mark the behavior. A hand signal can also be used to be the "click." But using a hand signal would be similar to using the word "good" to mark the behavior. When we use a verbal "click," it is virtually impossible to say it exactly the same way each time. And if you recall in my last blog and how I discussed how Wiley can discriminate differences and not generalize, he would take longer to learn a behavior if I used verbal "clicks." My tone would be different each time no matter how much I try and say it the same and I know me well enough to know I wouldn't be concentrating on making sure my "good" sounded the same. Doing a hand signal would be similar to the verbal "click" and you would be mostly training your dog to understand hand signals to indicate what behavior you are wanting so that could get confusing for both you and the dog to use a hand signal as the "click." The click is a click and sounds the same all the time. The same is true for the light source of a flash light. This doesn't mean you can't use hand signals or verbal clicks. Just be aware that it may take longer to get the behavior you are training and do your best to be consistent with how you say it or your hand signal. I found this interesting link on clicker training deaf dogs. Thanks for asking questions and please keep them coming! 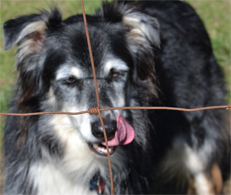 In an earlier blog, I wrote about how training my dog, Wiley, became a clicker training 'Aha' moment for me. I became a clicker training convert watching him learn more rapidly using the clicker and my first 'Aha' moment came when I saw that it was upon me to be consistent with the way I train. Wiley's slower progress learning to walk with proper manners wasn't because he wasn't getting it. It was because I was not consistent in how I was teaching him. Clicker training made me become more aware of what I was doing and I began to learn more about how Wiley's brain works. He doesn't generalize like I do. If I learned how to do something on my right side, I'd know what I'd need to do on my left side but for Wiley, it was a totally new thing. His right was different than his left. If I used my right hand to hand signal a sit and then switch to my left hand, I had to train him that the left hand signal meant the same thing. To him, my other hand meant something else until he learned otherwise. If I moved an object in my house, that would be the first thing he would go look at. He'd notice the difference immediately. I experimented doing just that and was amazed that each time, I would move some object in the house, he'd know right away and go and sniff it. Learning how his brain works and how Wiley sees the world helped me know what it was that I needed to be a better trainer with him. At the same time I was training Wiley and learning all this new way of thinking about training, I was counseling a young boy that had been recently diagnosed by his doctors with Asperger's Syndrome. He had a lot of conduct issues at school and home and his parents were hoping I'd be able to help him with those issues. I had been seeing him nearly a year with minimal progress and if anything, his conduct had worsened as he approached adolescence. I researched and read more on Asperger's trying to understand it better so as to help my client. I read this one book written from the perspective of an autistic person. That was so enlightening and it reminded me of how Wiley sees the world. I got to wondering if clicker training would work with this child the way it did with Wiley. I asked the parents' permission if I could bring Wiley to my client's sessions. They agreed and I brought Wiley. This boy and Wiley hit it off immediately. It was the first time I'd heard this boy laugh with gusto as he engaged with Wiley. I knew magic was happening. The second session, I showed the boy how I was training Wiley with the clicker and asked if he would like to learn how to train Wiley. He was eager to learn. I told him how to clicker train Wiley and that we click him when he did the right thing we asked him to do. We don't punish Wiley when he doesn't do things right but reward him when he does do things correctly. I saw this boy gaining confidence and was excited to come to sessions. This boy was not only giving positive reinforcement to Wiley but he was receiving it too from both Wiley and me. It was not something this boy got a lot of. He was getting plenty of attention for his conduct issues but it was always negative and reminding him that he was always wrong or bad. Suddenly, he was doing something right and his reward was Wiley looking up at him with such eagerness and adoration and pure joy. After a couple of months, I checked in with my client's mom to see how things were going. I had typically received calls from her more regularly with issues he was having at school but had not gotten one of those calls for some time. She told me he was doing much better in school. He had asked to join a new group outside school and was participating more in school activities. He still had some issues with conduct but they were improving. My client understood clicker training right away and he drank up the positive reinforcing like a sponge. It was truly magical to watch the progress of this young boy opening up to such positive ways. Thanks to my clicker training with Wiley, I learned such a valuable lesson that I try and carry with me to this day. I learned that I need to step outside my way of thinking and become more aware of where the other person or animal is coming from. So instead of being frustrated like I was with Wiley because he wasn't getting how to heel on both sides, I learned to work from his view of the world instead of my view. Clicker training is such a valuable tool. For more on how Clicker Training can work with kids, check out TAGTEACH. After my clicker training efforts with Wiley and my client, I attended the first workshop where TAGTEACH focused on working with kids similar to my own client. It was so wonderful knowing others had the same thought as I did of the power and benefit this tool can provide and they are actually studying it at some Universities now. YAY for Positive Reinforcement! I had a break from writing blogs to deliver the first cria of 2013. A cute baby boy was born on the farm last Tuesday. 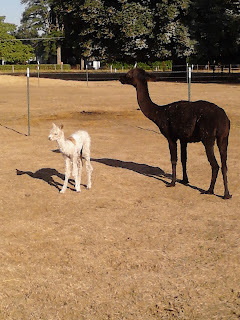 During her labor, I observed alpaca instinct in protecting the expectant mom. I had noticed Shadow Mist in labor and was watching from her progress from a distance so not to disturb or upset her. Suddenly, several alpacas looked alert at something they spied across the road from my farm. I didn't see anything but they did. One of the girls alarmed making their trumpeting sound. Several in the group where Shadow Mist is a member ran away from her and stood near the girls in the other fenced off area. Two females ran to Shadow Mist and stood next to her under my huge maple tree. Shadow Mist started to have a contraction and Misty turned to Shadow Mist and spat at her several times. Shadow Mist stopped contracting and Misty and Dove stood on each side of Shadow Mist. The other girls alarmed again. I ran to get my livestock guardian dogs who I had just moved out of that pasture because I didn't want them upsetting Shadow Mist. They bolted to the fence to check out what was alarming their alpacas. I headed out too still watching the interaction of the alpacas and trying to see what was alarming the alpacas. Jamilah, my wisest alpaca on the farm, slowly moved out of the group that had been alarming. She rarely alarms yet the herd sees her as the head of the herd. Because she doesn't alarm much, if she is upset by something, the other alpacas know they should be concerned and if she looks at the scary thing and goes back to grazing knowing it is nothing to worry about, the others tend to go back to what they were doing too. I have a few that alarm over any little thing so they tend to get ignored after awhile. All stopped alarming and watched Jamilah who went out towards the road all by herself. This too was not normal behavior for Jamilah. She tends to stay closer to barn area and not go out as far in the field. She is getting older and achier so she prefers not to walk out as far but this time, she alone walked towards the road with all eyes on her. Jamilah's ears were up and pointed towards where they had seen whatever it was. She stood there for a few moments very alert and watchful. A few moments passed and she lowered her head and began grazing. The others took her cue and went back to their grazing or meandering. Misty and Dove separated from Shadow Mist to continue on with her labor. Getting the opportunity to see a cria being born is such a wonderful gift. I got a bonus on this day of getting to observe the alpacas working together to protect one of their herd in her vulnerable state. I wasn't an immediate convert to clicker training. I had trained my dog Rusty using the more "conventional" way and he was such an amazing dog. We had such a close connection. When he passed away, I didn't think I'd ever have that again with another dog. I got Wiley as a puppy a few months after Rusty died. Wiley was such a handful as a puppy. I signed up for classes and the instructor happened to use clicker training positive reinforcement methods. I liked how she taught but I just didn't see how that little clicker made that big a difference. Wiley was smart and picked up new behaviors quickly and easily. But the one area we struggled with was walking nicely on a leash. He pulled unmercifully. Walking with Rusty was one of my favorite times. We would get up before work and go to the beach for a walk or jog. I don't know if I enjoyed it so much because of the beauty of the beach and getting out in the fresh ocean air or because I just loved how much Rusty enjoyed our walks. His face just lit up and showed shear joy. He was such an easy boy to walk or jog with. I had a stretchy lead rope that I attached to a fanny pack I wore so I could have my hands free. We were so in sync. I knew getting a puppy was starting at square one but knowing it in my head was different than knowing it in my heart. I was still grieving Rusty and having Wiley yanking my arm out of its socket made missing Rusty even worse. The walks I so enjoyed became a chore. So many things that I took for granted had become a challenge with raising a new puppy. I loved my new puppy but he had become another chore and one that I wasn't sure I would get to a point that I would be in sync with like I had been with Rusty. I enjoyed Wiley and he was a real adorable little fluff ball but he was one tough puppy to train. He was too smart, stubborn and headstrong. Three strong traits in a personality that make training tough. I knew if I had a chance of ever truly enjoying Wiley and having him be a dog I adored, getting him to walk nicely was the key. It took several months of not having enjoyable walks that I finally did what you should do as a trainer when you aren't getting the responses you think you should. I looked in the mirror to see what I was doing. I was making several mistakes. The first mistake was that I was trying to go for an enjoyable walk instead of going out to train a skill of walking nicely on a lead. I was so badly needing and wanting that experience of enjoying my walks that I was imposing it on this puppy that hadn't learned that skill and I was getting frustrated and angry with him when it wasn't his fault. It was mine because I hadn't taught him yet what he needed to learn. I was projecting my grief and sadness of losing Rusty on this little puppy. The second mistake was a real basic training mistake. I was using about 4 or 5 different commands to mean the same thing. I wanted Wiley to learn how to walk at my side and with a slack lead. To tell him that was what I wanted, I used "heel," "wait," "stop pulling," "whoa," and the most often used word that means nothing, "NO!" Dogs have the ability to discriminate. Wiley is such a smart dog that he knows the difference between right side and left side so if I taught him something on my right, I had to teach him the same thing on my left if that was something I wanted him to know because he saw them as distinctly different things. Wiley was trying to figure out what I was asking of him but with so many different words, he didn't get that they all meant the same thing. I knew it but he didn't. In class, when our instructor told us and showed us how dog were good at discriminating such differences was my "Aha!" moment. I saw that I was being inconsistent and confusing Wiley. I put my emotional needs aside to deal with outside training and deal with myself and I worked on becoming consistent in the words I used to tell Wiley what I wanted from him. And, I pulled out my clicker. Instead of going out for a walk, we went out for a training session. If we only went a half a block, that was ok. If my ultimate goal was to go for nice long walks, then that was what I had to do. We went for maybe a block that first training session after my "aha!" moment. I clicked Wiley for healing and if he pulled too hard, I would either turn and walk the opposite directions away from what Wiley was interested in that he was pulling me towards or I would take three steps backwards away from the object of his interest. It was a lot of one step forward and three steps back. But by being really consistent about not rewarding his pulling AND rewarding when he WAS in the correct position, our walking started to improve quickly. We had stagnated for months with me getting in the car mad and frustrated with a sore arm, but once I realized what I was responsible for in our training, the training began to progress and it progressed rapidly. I became a clicker training convert on those first walking successes with Wiley. I saw how being consistent in what I asked for and clicking for correct behavior engaged Wiley like I had never seen before. He was so eager to learn and it was almost like I could see the stress leave his body. I admit, I felt a little badly that I was causing it to be not fun for him either on our walks with my inconsistency. I had confused him so badly in using so many terms to ask for the same thing that he was frustrated too. 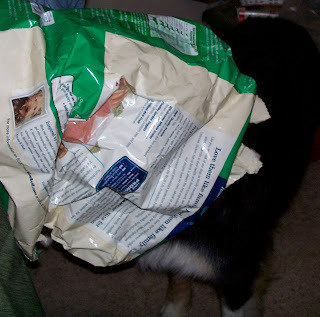 Being an Australian Shepherd, he is a working dog and he wants to do his job. As I clicked Wiley and cheered him on for doing things right, I felt a shift in my dog and in me too as some of the grief and sadness of missing Rusty was replaced with the joy of seeing this new puppy learning. I started to enjoy the process of training him more. The click and reward and seeing Wiley's face light up when he heard the click, transformed our walks into a fun outing even when we went for a block. Clicker training has provided many Aha moments in my life. Amazing how a little click can provide so many life lessons. In my next blog, I'm going to continue with how this Aha moment and clicker training Wiley helped me understand a young boy I was counseling. Wiley getting into mischief. He was walking around the house as if nothing was amiss. My first alpaca clicker training experience was an utter and complete failure. I had never owned or been around livestock before buying Dulcinea. I owned and trained my dogs and been to many clicker training workshops for them. My first day trying to clicker train Dulcie, I came out with my gear I use for training my dogs and was quickly humbled when Dulcie looked at me with such suspicion and wouldn't come close to me. Forget the target stick and training pouch. She wasn't coming close to me to take pellets from me at all! How can I clicker train if they won't take an award or treat? I walked off the farm I was boarding at deflated, embarrassed and completely unsure of myself. But I'm one to enjoy a challenge so the next time out to the farm, I left all the gear at home and checked my ego at the barn and went into Dulcie's pen with a bucket of pellets and my clicker and I sat down in the dirt. My first lesson was to assess and see what Dulcie was doing as I tried different ideas to get her to eat from the bucket. I had the bucket near me and I saw her look at the bucket but she wasn't going to come near me. I moved the bucket closer to her but the bucket was still too close to me. I got up and moved the bucket near Dulcie and then moved as far away as I could and sat back down. It took several minutes before she thought about going near the bucket. She sniffed in it and saw there were pellets but she still wouldn't eat from the bucket. She moved to the hay bin and stayed there. I sat there wondering what else could I do? I took some pellets and sprinkled them on her hay. She backed to the furthest spot from me each time I made a move. She wasn't near the hay anymore so that idea didn't work. I sprinkled some on the ground and sat back down. Finally, I decided to stop trying and just sit still. No pellets taken. The next trip to the farm, I didn't have any new ideas so went out with the bucket. I knew she wouldn't go near the bucket if it was near me so I placed it near the hay feeder and sat down as far away as I could from Dulcie and the bucket. I watched and stayed quiet not moving. Instead of moving and trying different things like the previous attempt, I just sat still. Dulcie came over and sniffed at the bucket again. She looked at me and back into the bucket. I could see her trying to decide if she wanted those pellets. She took a quick bite and ran away. I learned a lot watching her take that first bite. She was vulnerable with her head in the bucket. She was so extremely wary of me. But nothing bad happened and I held my breath and didn't move a muscle when she took that first bite. She braved a second bite. I clicked as she took a bite and she didn't bolt from the bucket like the first time. She went back and had another bite and soon she was taking one bite after another and I clicked each time she put her head in the bucket and ate. I didn't want her gorge herself so I moved to get the bucket and she jumped away. I moved the bucket to a new location and sat back down. After several minutes, Dulcie came back and braved eating from the bucket. Clicker training was starting. It was such a baby step in teaching Dulcie yet I was learning a ton about alpacas and how to work with them. My training goal was to get Dulcie to eat from my hand but to get to that point, I had to keep breaking down the steps into smaller and smaller ones until I found one we could be successful at. Once she ate from the bucket, I was still at a loss of how to get from bucket to hand. I asked a clicker training friend of mine for advise and ideas and she suggested a spoon. It extended my reach so Dulcie would be further away from me. That didn't work at all. It was a good theory but Dulcie saw this foreign object that she had never seen before and was back to being as skittish as our first day. The spoon got stowed away. I found a feed scoop at the feed store. It had a wider opening and looked more like a bucket of grain which Dulcie was used to. I came out with that and placed it on the ground and she ate from it. Yay! One step closer. I sat with the scoop so she had to come to me to get her pellets. She got pretty comfortable eating from the scoop but each time I tried to get her to eat from my hand, she wouldn't go for it. I needed another step between scoop and hand. I finally got the idea of placing my hand under the scoop. This allowed Dulcie to get used to my arm being in the same position as it would be if she were eating from my hand but it was from her comfort zone of eating from the scoop. At first, Dulcie was eating directly from the scoop with my hand holding the bottom of the scoop. She didn't see my hand at all. But as she got more comfortable with my arm in that position, I moved the scoop so my fingertips showed. Dulcie had to brush my fingertips with her lips and chin to get to the pellets. The first time, she jumped back. But she was hooked on the pellets. She looked at the scoop and my fingertips and decided to try eating. I didn't move those fingertips at all and she saw that she could eat just like she did before. I let her do that several times and then moved the scoop up so more of my fingers showed and repeated those same steps. I observed that Dulcie got more comfortable with my hand being there with each click. I now had my palm showing and I sprinkled some pellets into my palm so she could take from the palm of my hand or go into the scoop to get her pellets. The first try or two, she went into the scoop and then finally, she ate from my hand without realizing it was my hand! Success! Well, sort of success. I still had the scoop there. I slowly pulled the scoop away and within a few more tries, she was eating comfortably from my hand and no scoop. It took three weeks of doing all these steps before I had my ultimate goal reached of Dulcie eating from my hand. Because it wasn't easy getting Dulcie to get her to step one of clicker training, taking food from the hand, I had to learn patience both with her and myself. I went from having my ego pretty much demolished after that first clicker training attempt to building my confidence as each effort and small success showed me I could do this. It became a fun challenge as I explored how to break down each step until I got a success. It made me a much better trainer because I had to observe and understand where the starting point was and then how to figure out the steps to get her to the final goal. That simple concept has been a real life lesson. Looking back at the various life experiences I have had, it has followed that pattern of at first "failing," then picking myself up and figuring out what I needed to learn and do to get to the goal I didn't accomplish the first time out. In the case with Dulcie, the simple task of getting an alpaca to eat from my hand has led to me becoming passionate about training alpacas and positive reinforcement training, and building a business doing it. I shutter to think what I would have missed if I stopped at those first feelings of failure. It turned out to be the best failure ever! If you like to read about more of these experiences, my book Alpacas Don't Do That is coming out very soon! Advanced sales will be announced in the coming days! 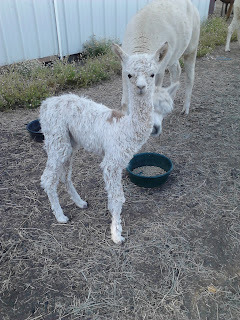 Alpaca Halter Game Pictures: as Requested! I have gotten some requests to provide some pictures to illustrate how I clicker train alpacas to stick their noses through their halters in playing the halter game. 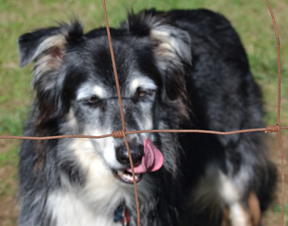 I had young helpers visiting on the farm so I pulled out a clicker and some treats and a camera and took some pictures. The first picture shows how I start with the halter up on the wrist dangling. This gets the alpaca used to just seeing the halter. Jujube learning the halter game. As the alpaca gets more comfortable, I bring the halter closer to their nose so they have to put their nose through the halter to get to the treat. The goodies are used to lure the alpaca through the halter. It is their choice to pick whether they rather have the goodies or be afraid of the halter. 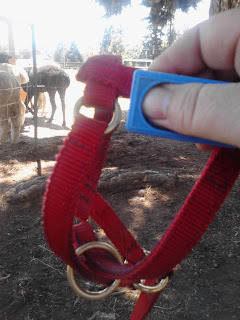 If they become too uncomfortable with the halter or not ready to stick their nose through, I move the halter pack up my wrist or arm and slowly bring it back down between clicks and bites until they get more used to it. But, I have found most do not worry about the halter at all. I'm holding the clicker on the cross piece of the halter. Once the alpaca is putting their nose through the halter being lured by the food. I will start using the verbal cue, "halter." In the above picture, you can see where I hold the clicker and halter. That hand holds both so the other hand can hold the treats to lure the alpaca through. This way of holding clicker and halter also allows me to place my body parallel to the alpaca so they begin sticking their noses through the halter without luring and I'm in the correct position to eventually place my hand on their neck and hold them to buckle the halter on. I don't buckle it for quite a number of training sessions. I simply play the halter game to get them very comfortable with putting this foreign thing on their noses and have it be fun. It often only takes one clicker session to get the alpacas to learn to stick their noses through the halter without luring even! They really like this game and I enjoy playing it with weanlings especially. This I often do in a group and it is funny as two or more try sticking their noses through at the same time! Thanks for requesting more information on clicker training and please let me know if more topics are wanted or for me to expand on already covered topics. My alpacas running to me after I have called them. "Your alpacas are so spoiled." I hear that comment more times than I can count. The way I prefer to think about it and to be more accurate, my alpacas are well rewarded. What is the difference? Maybe it's semantics, but I would suggest that it has a different meaning. My definition of spoiling someone, means there are no or few boundaries. No matter the behavior, there is a reward. 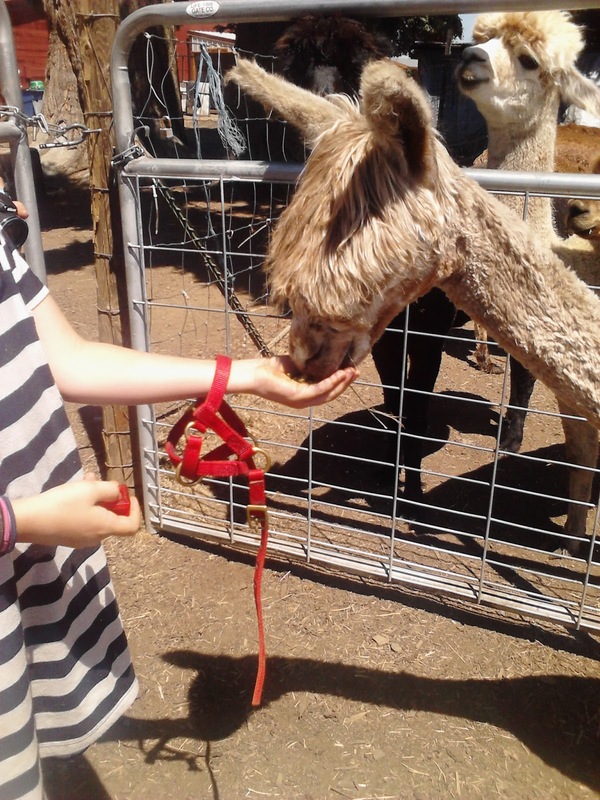 The alpaca would get treats whether they perform correct or bad behaviors. That is not how I use rewards. 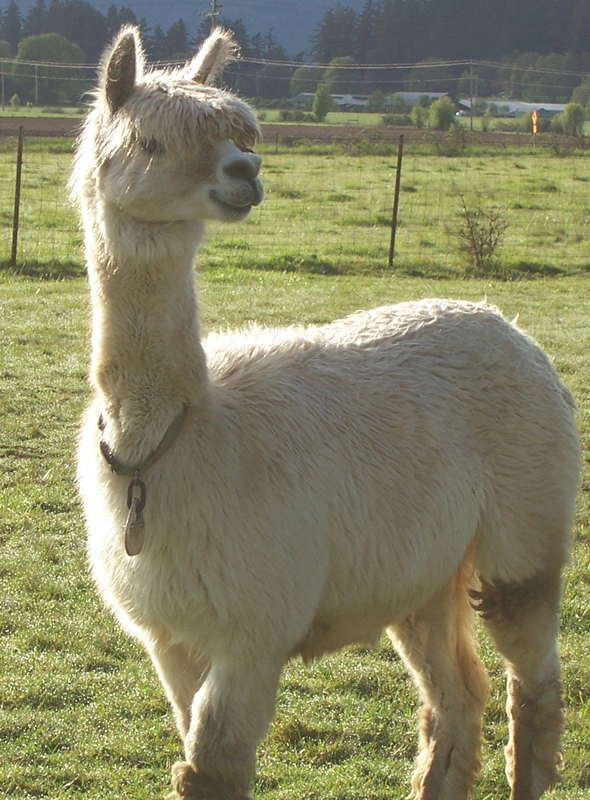 I treat and reward an alpaca performing a correct and desirable behavior. I do NOT reward bad behavior and I work hard to modify behaviors that are undesirable. It is rather interesting to use such a negative term like "spoil," to describe the type of training I do. I use positive reinforcement methods to train. When I first began clicker training and was asked what that meant, I would watch people, especially experienced animal trainers roll their eyes. I'd hear similar responses and very negative opinions of the effectiveness of clicker training. Some were down right angry about it and behaved rather rudely towards me. It was amazing to see such negativity over using such a positive approach to training. I am always thrilled to watch more and more experts being converted and speaking more openly of using positive reinforcement to train animals. I was asked to help this one woman with her alpacas many years ago. I worked with her alpacas a few times when she asked me about her dog. She told me how her dog was "untrainable." I asked her for some dog treats since all I had were alpaca treats on me. While she went on to tell me how many trainers she had been through and how this dog never learns, I started to clicker train her dog and listening to her story. Without saying a word and while she was telling me her training woes, I had her dog sitting consistently on a hand signal and eagerly waiting for another click. She stopped talking suddenly as she realized I had her dog sitting. Just as suddenly, she became a believer and was telling me how she knew that clicker training would be the best training. I went on to teach her dog to do a down all in span of about 10 minutes. Some may say, giving out goodies even for good behavior is spoiling. I wonder if those same folks are willing to go to work everyday and not get a paycheck? I don't think so. You earn that income and for the same logic, my alpacas earn their goodies. I'm asking them to go against their basic instincts. I'm asking them to come running to me and I'm a predator in their eyes. I'm asking them to place their noses in a halter, be touched and handled. None of these behaviors are ones that a typical alpaca willingly wants to do. The alpacas would certainly be less likely to offer and modify such instinctual behaviors just to please me. I'm more likely to get my alpacas to behave nicely because I pay them very well for consistent and really good behavior. And, because I reward my alpacas well, I have animals that people love coming to visit time and again and I have alpacas people want to purchase because they are so easy to be with. So, someone may call it spoiling, I call it smart business! 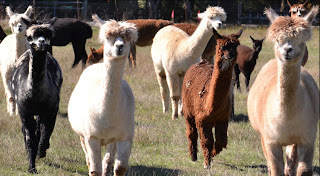 In previous blogs, I've talked about using treats as rewards and teaching the alpacas to take turns. The main reason I want them to learn how to take turns came about because I accidentally trained a negative behavior. It was during my earlier experimenting with clicker training alpacas and I was working with my first alpaca Dulcie. I had come a long way with her. It took almost three weeks just of me sitting on the ground to get Dulcie to take pellets from my hand. Once I got her to eat from my hand, the rest of the training sped up dramatically. I had her touching her nose to a target stick, sticking her nose through halters, and the best part was how she would run to me when she'd see me. I could put my hand on Dulcie, hold and halter her in the middle of the pasture. She had been notorious for being one of the hardest alpacas to catch. It would often take several people to corral her. So, when folks saw Dulcie running to me when I'd come out to the farm where I was boarding, their mouths would drop and they'd shake their heads as they'd see me catching her as quietly and nicely as could be in the middle of the pasture. Clicker training was proving to be so successful. Then an ornery alpaca was placed in the same pen as Dulcie. She would act like she was friendly and lure you in to greet her and then as soon as you got close, she'd spit at you. She was in constant spit fights with the other alpacas too so no one really cared for this girl. No one wanted to get spat at including me. When I went out to work with Dulcie, this female alpaca would follow Dulcie to see why she was running to me. Dulcie was late term pregnancy so I wasn't working with her much but I'd go out and just give her treats. I didn't want to stress her at this stage but simple clicking of hand touches and kisses were good practice to keep the clicker games fresh without stressing her. This other alpaca would want treats when I was treating Dulcie but instead of taking treats nicely, she'd spit at Dulcie to back her away and spit at me. I knew enough not to reward that bad behavior so I'd walk away. This happened consistently and I'd try and get Dulcie away by ourselves, but this female would follow us and interfere. A few weeks of this happening and Dulcie stopped running to me even if this other alpaca was napping or busy grazing. Dulcie wouldn't come to get a treat from me. At the time, I hadn't quite put all the pieces together but I was disappointed that my girl was staying away from me. By then, I was working with other alpacas so I was starting to spend more time with them too. I wasn't cluing into having a problem and setback with training right away which allowed the negative behavior to get trained in more solidly. After weeks passed and no improvement in working with Dulcie, it finally dawned on me that I had become a negative to Dulcie. Every time, I came out to give her treats, she would get bullied and spat at. So, she had learned to associate me with this negative treatment and I wasn't worth running to if all she was going to get for it was spat at. I requested from the farm owner if I could move Dulcie to another pasture and why. She said of course and I moved Dulcie. It was about time for Dulcie to get moved to the maternity pasture so I moved her there. I was hopeful that as soon as I moved her away from this other alpaca, that things would improve but they didn't. I wasn't sure if it was because of her instinct to protect her baby she was carrying or because of all the negative reinforcing that occurred. I was crestfallen that I had lost all that progress I had gained with Dulcie and I wasn't sure how or if I'd get it back. The good news is that I did get it back. The story of how I did is in my book Alpacas Don't Do That. Yes, I'm doing a shameless tease and plug!!! But, the reason I will take a little spit during training now and teach taking turns is because of that incident. I will not reward the spitter with treats, but I look for behaviors I can reward them with and when I can catch the alpaca with the propensity to spit doing a positive behavior, I will feed them. However, I feed using this method. I place my hand with the treats at the level of their chest so their head goes downward and I move my hand towards their chest so they must take a step backwards to get to the treat. This places the alpaca in a more submissive body language position and they tend not to spit with their head down and if they do, the spit harmlessly goes towards the ground. I try and be very consistent in treating these alpacas this way ALL the time. If I am consistent in feeding those alpacas with their head down and taking a step back, after awhile, they have learned that standing further away from me is better than too close and being spitty. I turn my back on them if they spit and hopefully I'm fast enough if I hear it coming to duck out of the way, but I try not to walk away from the others I am working with because of the one bad behaved alpaca. That is when I take one for the cause. When training, we often have to put on our detective hats. If we had a behavior we liked and it isn't happening anymore, we have to take a step back and look at the bigger picture of what is going on. Is there something I'm doing differently? Is there an environmental change? What has changed? When we can piece together some theories of what may have created the change in behavior, then we can work on the steps to get back the desirable behavior. Can A Reward Be A Touch for an Alpaca? When I first got into alpacas, it was sometimes easier not to buy into the "learned" experience of what alpacas can or cannot do. I didn't have any alpaca experience so I didn't know what I didn't know! I quickly learned alpacas didn't like to be touched, but I didn't believe for one second I couldn't train them to accept touching. I had plenty of confidence in the positive training methods to know that training new behaviors were possible. The only limit was based on my abilities and thinking. Fortunately for me, when people tell me things aren't possible, I usually wonder why and then see if I can't find a way to make it possible. My favorite quote is, "Some men see things as they are and say why? I dream of things that never were and say why not?" As I was performing my routine raking duties in the one boy pasture, Mowgli came up to me. I could tell he wanted to engage with me. He has been doing that more often recently since I dusted of my clicker. But I had no clicker today and no pouch with goodies. I stopped raking and bent my head down to see if he would give me a nuzzle. He reached over and gave me a kiss and while I was still bent down, I rubbed his chest. He stood there for quite a long time. I took my glove off so I could give him a really good, hard scratch and he just stood there enjoying the long rub down. When he had enough, he walked away. I put my glove back on and went back to my chores. As I raked, I got to thinking that this was the first time Mowgli initiated wanting his chest rubbed. I have had to use my body language and ease him into experiencing having a chest scratch. My younger alpacas have been the first ones I have experimented with having the chest scratch which I talked about in my last blog, Alpaca Clicker Training Rewards. Seeing how much the youngsters enjoy the chest scratch, I decided to see if an adult alpaca would like it. Mowgli is my gelding male who is one of my farm ambassadors and a good guy to try new things with. The first time I tried to give him a scratch, Mowgli took several steps back not sure what that was about. For males, someone bending down to touch lower like that usually means an act of aggression since males like to grab and bite each others' feet in tussles. Mowgli will let me rub his neck sometimes but touching has never been one of his favorite things. In other words, I wouldn't associate patting him as a positive reinforcement. He had learned to accept and tolerate touching to a certain extent would be a better description. Today, however, he came over and not only did he enjoy his chest scratch, but I believe he was asking to get one. There was something about his body language and maybe mental picture I was getting from him that this was what he wanted. And, the fact that he stayed as long as he did for the scratch told me he really wanted it. Each time I have tried to give him a chest scratch, he has allowed me to do so for longer periods, but it has always been initiated by me to do the chest scratch. Today, it was initiated by Mowgli. I got to wondering afterwards, if the chest scratch could turn into a reward and positive reinforcer. Now that would be something to use touching as a reward for an alpaca! Talk about Alpacas Don't Do That, which is the title of my book coming out soon. That would be really something if instead of clicking the alpaca and giving pellets as the reward that the reward would be a scratch. I've seen that done for other animals but they are known to enjoy pats. Peggy Hogan has a neat video clip of her using scratches as the reward as she clicker trains a mini-horse. Time will tell if I can get Mowgli and a couple of others that have learned to enjoy the chest scratch as a reward for clicker training. Today I was reminded to get out of that mentality of limited thinking and get back into wondering what might be possible and it all started with a chest scratch. I suppose some might wonder why it is a good thing or worth the time. My answer to that is because the more tools I have to utilize, the more effective I can be at training and getting the results I'm working towards. It would be nice to have a reward that doesn't require food that I often don't have on me. How wonderful to give a quick scratch when an alpaca deserves a reward and them liking it! Also, having a mix of rewards makes training more effective. One of the limits I have had with alpaca training has been how lacking in variety the rewards are so I'm always trying to find things alpacas really enjoy to turn that into a reward. Stay tuned as I ponder on how to turn a learned and trained behavior of chest scratch into a reward! Mowgli Reminding Me Of Dreaming Why Not? One caution about males especially, you must have appropriate behavior in males. When I'm socializing young males in particular, they MUST behave with respect. There is what is called Berserk Male Syndrome that might be started by over socializing and allowing bad behavior in a male. So I must caution folks to be careful. I have very good boundaries with my alpacas and even though folks say I spoil them (I do), I also expect and require good behavior in return. A male is not allowed to jump on me, bump into me, bite at my feet or any other behavior that is undesirable. It maybe cute as a baby but when they become adult 150+ pound males, they can become dangerous behaviors. I nip those behaviors in the bud if I see them as youngsters. By having good manners and appropriate boundaries, I have adult males I can enjoy as well. A guest clicker training an alpaca to go through the hoop. Another most often asked question I get is, "Do I have to reward?" My answer is, "When you go to work, do you like to get paid?" Do I click and reward all the time? Every time I click, I reward. If I do an inadvertent click, they get a treat. Click means I owe them payment. If you don't reward, you lessen the effectiveness and meaning of the click. I find it interesting that some folks have a hard time wanting to reward. If I were back working as a counselor, it would be great fodder for a therapy session! However, I don't do that anymore so I tell folks, reward when you click. I'm not in constant training mode. I only use the clicker when I'm doing a formal training session. But I still use treats and rewards when I'm not in formal clicker mode. I use rewards for socializing. I want my alpacas to come running and hang out with me especially when I have farm visitors. Mine LOVE visitors and they got that way because they know there is usually carrots or apples coming their way. They see a car pull up to my farm and they watch the gate to see which way visitors come. If they start heading to the big green gate that leads to their pastures, the alpacas often come running to greet. It is fun to see how the alpacas get as excited at seeing guests as the guests are seeing the alpacas. If the alpacas don't see the guests arrive, I can walk them out, call one of the alpacas by name that I am fairly confident that they will come to me, and they typically bring the rest of the herd and once the one starts running to me, it becomes a race to see who can get to us first. It is a hoot. Do I only use food as a reward? Nope. I look for other things that the alpacas like and enjoy as a reward. On a hot day, it is the hose. They love the hose to cool off. I water their feet and bellies and they dance as the water tickles their toes. I have also discovered with this last crop of cria that some like their chests scratched. They can't reach their chest to scratch with their feet or by rolling or rubbing up against trees and fences. It is that spot they can't reach. The first time, I tried it with Calvin, he pulled away and then he stopped and thought about it a second and realized that it felt good. So he came back over and I scratched it again and he let me scratch longer. He made the funniest face as I hit the perfect spot. He pursed his lips and made a smooching noise with his lips. Calvin will come over to me asking for a chest scratch now. He has taken his head and neck to my hand and pushed it towards his chest! Several of the other babies have learned to like it as well. Mowgli, my 4 year old gelding, has recently learned that about chest scratches and he will stand still as I give his chest a good rub. Do I give treats every time I go out to see my alpacas? Not anymore. What I do is the Vegas method. Why do people play slot machines? Because once in awhile, you hear ding, ding, ding and you win (in my case pennies since I am only brave enough to play penny slots!). Using that similar psychology of Vegas, the alpacas never quite know when I will have treats so they come running to me almost every time because this maybe the time I have the goodies. Going out every time with goodies is actually less effective than mixing it up. In the beginning, it was way more often that I had goodies and now it is sometimes twice in one day, some days they don't get any extra goodies at all. Some days the goodies come from visitors and not me. They never know when the goodies will come or from what two-legger so they come each time. When I am in clicker training mode and treating each time I click, I will often mix up how much treats they get for a click. I typically use rice bran or their normal pellets for rewards. Carrots and apples take too long to chew and I click pretty fast when I am in training mode. When I am teaching a new behavior especially, it is important to keep them focused and too much time between clicks will take longer to get them to recognize what they are being clicked for. If I do use carrots or apples, I use very small pieces. They are really just getting a taste of a treat. A handful of rice bran or pellets will last at least 5 or 6 clicks. They just get a small bite or taste. I don't feed the entire handful for a click. However, if they are not as focused or losing attention or I see that they finally are getting what I'm training, I will vary how much I reward. How I do this is to give them two-three or more trips to the hand for a nibble with just the one click. For example, I'm teaching Mowgli to take a step backwards on command. The first time he stepped backward without me luring him, I clicked and let him take a small bite from my hand once, then again and then again. I only clicked the one time as he took the step back but he was allowed to come back to the hand three times. That is more powerful than letting him eat the entire handful in one setting. I closed my hand between bites and offered him treats three times. It was like getting paid three times instead of once. It really isn't the quantity of food, it is the quantity of rewarding. Some folks say I spoil my alpacas. I call it good business. When visitors tell me that they have been to other farms but my alpacas are way more friendlier and social, that tells me that what I'm doing is working. Those guests that might be interested in buying will be more likely to want an alpaca that is high quality AND one that they can engage with and enjoy. Plus, I have better confidence that the alpacas will go to new farms where they will be enjoyed and cared for. And the best part is that I get to enjoy them until I do sell them. I wanted my own farm not just to work my fanny off but because I wanted to enjoy my alpacas. Raking beans is not an exciting job but one that has to be done every day. No one probably enjoys raking more than me because I have alpacas come over bowing and giving kisses. So when folks say my alpacas are spoiled, I think I'm the one that is spoiled! I am rewarded each and every day with alpacas that are enjoyable to be around. To get to that place of enjoying alpacas the way I do is only a click and reward away! In summary, I use rewards in two different ways. 1) When I am using my clicker, they get a reward 100% of the time. 2) I will vary how many times they get to take from the treat hand but they will get a reward. 3) I use other rewards besides food like the hose or a chest scratch. I look for things the alpacas enjoy and use those as rewards. 4) When I am not using the clicker, I will reward to reinforce a behavior already learned. I mix up when I have a treat and when they will get it and how much they get. The alpaca never knows when they are going to hit a jackpot and will be more consistent about offering the behavior because they never know when the jackpot is going to happen. But, unlike Vegas, their opportunities to win a treat is higher than us two-leggers winning!!!! !